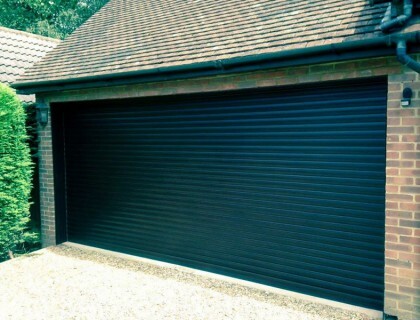 We are approved installers of the SWS SeceuroGlide roller garage door, which is the market leader on garage security. All of our garage door installations come with a single channel SeceuroSmart receiver with built-in light, two key fob transmitters, a bottom slat safety sensor and an internal manual override crank. All roller garage doors are available with an optional alarm (please ask for details). Full, half or no box – The SeceuroGlide roller garage door can be ordered with either a half, full or no box, its up to you. Refined Engineering – The 100mm fluted axle provides an ultra strong core, while the helical collars enable tighter space-saving coiling and significantly reduce curtain marking. 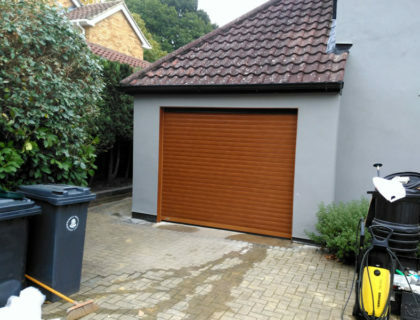 Manual Override – All roller garage doors are supplied with a simple manual override crank, ensuring you will never be accidentally locked in your garage – even in a power cut. Also available are external low-level override and battery backup options. SeceuroSense Control Unit – The SeceuroGlide garage door utilises the tried and tested SeceuroSmart control unit, which combines a light with both remote and push button control functions. The unit is also available with an optional 90db alarm system.